Our landscapers started this landscaping contract by clearing all grass, unwanted plants and rubbish from site and carting to dump. 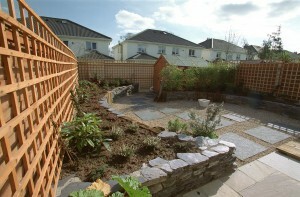 The raised beds were created using black natural stone from a quarry in Wicklow. 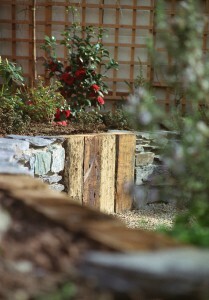 To create interest and contrasts we included railway sleepers laid vertically at intervals along the run. The beds were finished to a height of 40cm so as to double up as seating. 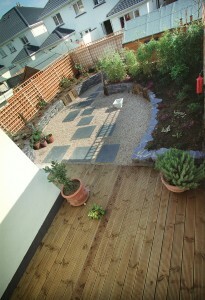 The raised beds were then filled with a soil and peat mix to create required ericaceous conditions. Peat on its own dry’s out easy, is hard to re-wet and allows fast leaching of nutrients. The timber deck was installed at the same level as the internal kitchen floor, this created the feeling of an outdoor room and connected the house to the garden. 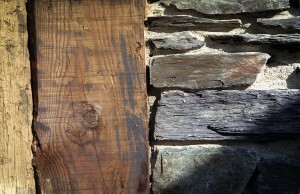 The materials used were pressure treated pine sourced from Woodfab, Aughrim, Co Wicklow. 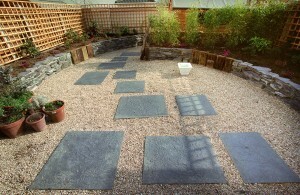 Our landscapers then installed the Liscannor stepping stones. The stones were hand picked and varied in size, they were laid randomly on a 3:1 cement mix and led to the garden shed which was moved to the right hand corner of the garden and hidden behind the raised bed. 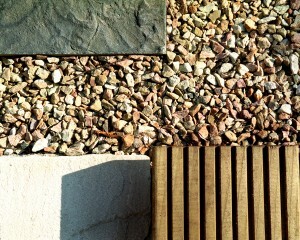 Terram geotextile was laid around the stepping stones to create a membrane against weeds in the gravel area. Ballylusk gravel from a quarry in Ashford,Co Wicklow was laid to a depth 0f 50mm, the baige colour of the gravel contrasted nicely with the black of the Liscannor stepping stones. The pressure treated native pine trellising was connected to the wall by 50x50mm latts, this would allow easy removal should the walls need future painting. Our landscapers then planted the ericaceous beds with heathers, camellias, azaleas, rhododendrons and Bamboo hedge to soften garden shed. Finally the side gate was installed to create a utility area along the side of the house for storage of wheelie bins, ladders etc.